Marco Rubio simply is not Constitutionally eligible. And he knows it. 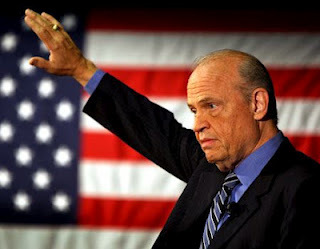 Law & Order actor (and former presidential candidate) Fred Thompson apparently needs schooling on what exactly is meant by the term “natural born citizen” as written in our Constitution. Are they deliberately ignoring Article 2 Section 1 Clause 5 or is it lack of education on the fundamentals of the Constitution that lead so many — including “tea party” citizens — to think men like Rubio and Jindal are eligible to be a heartbeat away from the presidency. Attorney Apuzzo’s explanation is detailed, comprehensive, scholarly and somewhat lengthy, and you can read the entire text of it here. So, Minor confirmed the original definition of a “natural born Citizen” used by the Founders and Framers. That definition is a child born in a country to parents who are “citizens” of that country at the time of the child’s birth. To date, that definition has not been changed, not even by the Fourteenth Amendment (only defines a “citizen of the United States) or U.S. v. Wong Kim Ark (construing the Fourteenth Amendment, only defined a “citizen of the United States”). Any other U.S. “citizen” is a “citizen of the United States” under the Fourteenth Amendment, Act of Congress, or treaty. So, today, a “natural born Citizen” is still a child born in the United States to parents who were “citizens” at the time of the child’s birth. That definition continues to be the supreme law of the land until changed by constitutional amendment. Barack Obama, Marco Rubio, and Bobby Jindal were all not born to U.S. “citizen” parents (“natural born Citizens” or “citizens of the United States” at birth or after birth) at the time of their birth. Being born to just one U.S. “citizen” parent (Obama’s birth circumstance) is not sufficient because the child inherits through jus sanguinis from the one non-U.S. citizen parent a foreign allegiance and citizenship just as strong as if born to two non-U.S. “citizen” parents. Hence, Obama, Rubio, and Jindal are all not “natural born Citizens.” Rubio and Jindal, being born in the United States and “subject to the jurisdiction thereof,” are “citizens of the United States” under the Fourteenth Amendment. If Obama was born in Hawaii, he too is a “citizen of the United States” under the Fourteenth Amendment. But what this means is that since Obama, Rubio, and Jindal are neither Article II “natural born Citizens” nor “Citizens of the United States, at the time of the Adoption of this Constitution” they are not eligible to be President and Commander in Chief of the Military or Vice-President. You can be assured that if Rubio is chosen by Romney to be his running mate, there’ll be such a hew and cry (translation: “stink”) about it, they will regret ever having made the move. I can guarantee it. And it will cost them precious votes from the constitutional conservatives who should be the most motivated voters of all. I was at a “chick-fil-a” event today-needless to say there were many who considered themselves “tea party” members who were familiar with the Constitution. Unfortunately-once again I was shocked after all this time to discover that they misconstrued the requirement to only mean born on US soil. When I explained it they understood what it meant and why the framers wrote it that way. But yeah-they are ignorant-stll! Thank you for taking the time to educate them. My father use to lecture me as a lad about ensuring the barn door was closed and locked so the cows did not get out and founder themselves in the cornfield. Today, the barn door of our Constitution is wide open thanks to the election of Obama and the silence of Congress and the Courts. We as Americans are foundering in the fields of dereliction. If Rubio is named VP candidate by Romney they will have succeed in completely dismantling the Constitution and like the foundered cow our carcass is left to rot from the remains of that dereliction.